Photo: High student to professor ratio – 12 Norsi students and 5 professors in the classroom! Participants at the Norsi course “Innovation Research, part 1” at BI Norwegian Business School. Thank you to Professors Bjørn T. Asheim, UiS; Anna Bergek, Chalmers University; Jan Fagerberg, University of Oslo; Ben Martin, University of Sussex and Knut Sogner, BI Norwegian Business School for taking time out of their busy schedules to lecture at this course. The students are Carina Beste, NTNU; Shanyun Sam Lu, Jönköping Int. business School; Sudip Kranti Tiwari, Nord; Christina Marie Mitcheltree, NTNU; Lise G. Haukeberg, HiMo; Maren Wiktorin Østensen, NTNU, Nhat Strøm-Andersen, UiO-TIK; Tina Løvsletten Troset, Nord; Elisabeth Cassidy Svennevik, UiO-TIK; Andrey Abadzhiev, Karlstad Uni. ; Cyriac George, UiO-TIK and Jørgen Aarhaug, UiO-TIK. 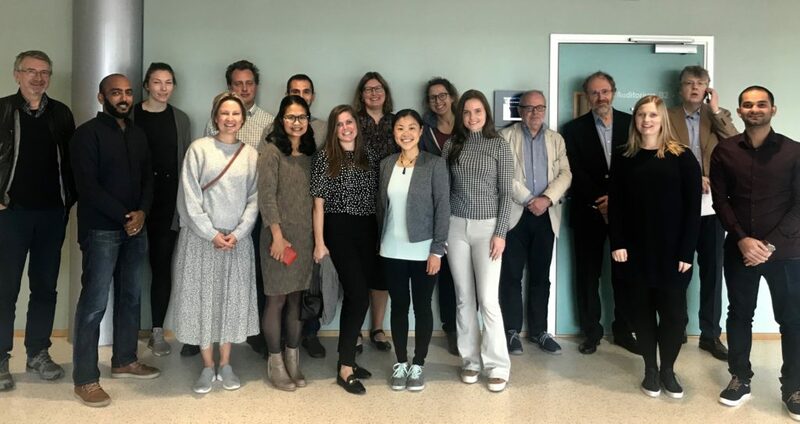 The NORSI course Innovation research – from origin to current frontier – IØ9802 aims to provide a set of advanced insights into the field of innovation studies focusing on theoretical developments as well as strategic innovation managment. Part 1: 17-19 September 2018: Policy and systems innovation at BI Norwegian Business School in Oslo. Part 2: 20-22 November 2018: Strategic Management of Innovation at NTNU, Trondheim. The course give 7,5 ECTS, and is accredited by NTNU. Registration: The registration us with NTNU when its available.Please click here to register for the course directly with NTNU. Please also email Birteto reserve a spot at the course. Send an email to Birte Horn-Hanssen (birte-m-horn-hanssen@bi.no). When: Every day from 9 am to 4 pm. The assignment for the innovation course is an academic paper. Max. length is 5000 words + references. Use your supervisor for advice and guidance before you submit your paper. We encourage you to link the paper to your own PhD project, however we expect you to make use of one or more perspectives taught during the course. Deadline: 30 January 2019 (date has been extended). Format: One pdf file. Please send the file to Roger Sørheim, NTNU (roger.sorheim@ntnu.no). The course aims to provide a set of advanced insights into innovation research spanning from foundational themes to the most recent developments of the field. The competitiveness of firms, economic growth and societal welfare in general depend on the ability to introduce innovative products, processes and services. It is divided into a system approach, i.e. the systemic nature of innovation and economic growth, and a corporate and a managerial approach, focusing in particular on strategic issues. Both approaches deal with how processes of innovation occur. Traditionally, the system approach has dealt primarily with the allocation of resources to innovation and its macroeconomic effects (e.g. the relation between innovation on the one hand and a country’s competitiveness and economic growth on the other), while the innovation process at the micro level (e.g. in firms) has been treated more or less as a ‘black box’. Innovation is a complex and dynamic organizational process – with repeating cycles of divergent and convergent activities – that both depends on and spurs of organizational learning and adaptation. Taking a strategic perspective on these processes is important to grasp opportunities and hindrances, as well as identifying the role of intentional action. Interest in management of innovation has traditionally centered on firm-internal aspects of processes such as, for instance, how collaboration and interaction among specialized professionals take place in the creation of innovation; how to deal with unavoidable uncertainty involved; and the path dependency in skills and resources. In recent years there has been a surge in interest among scholars and practitioners in methods that allow the firm systematically to source its inputs externally. Innovation that originate from sources external to the firm has emerged as an important phenomenon and has been associated with labels such as open innovation, user innovation, crowd sourcing, and open source. These trends have also given rise to novel and so far immature research agendas that promise to enhance our understanding of the processes and sources of innovation in the years to come. Scientific articles and selected literature – for part 1 please see schedule. The course is scheduled as two intensive seminars, as a combination of lectures, seminars and paper writing exercises. To provide insight in innovation research from its origin to recent development in the field. Candidates should be capable to reflect on innovation research on both macro and microlevel (and how different perspectives are interlinked). Candidates following the course should capable to reflect and position their own research within the field of innovation research. All NORSI students make their own travel arrangement (Economy). As this course is considered a NORSI course all travel expenses etc. will be covered for NORSI students. Same procedure as for other NORSI courses. NORSI students’ refund is dependent upon completion of course work and their status as a NORSI student. Travel and Accommodation (Hotel) for Oslo – Part 1: Participants should arrange travel and transport by themselves, however all travel expenses will be refunded for NORSI students. NORSI has reserved a block of rooms for NORSI students at Radisson Nydalen Hotel right next door to BI. To book a hotel room please email Birte with your preferred dates. PhD students register for the course that are not part of NORSI will have to cover their own expensens.